September started out with an amazing time at Grandpa Ron and Grandma Toni's house for dinner on the grill, dessert, and a bonfire for roasting marshmallows. The kiddos ran and played. Adults were able to enjoy themselves as well. It was the perfect end to the summer season. If only I would have remembered my camera. Sigh. The very next week, we settled into our fall routines. Dinomite continued horseback riding and swimming. Bulldozer started his fall session of one-to-one gymnastics lessons. Princess started gymnastics in a new upper level class setting. She also started Kung Fu. Sunshine started gymnastics in a very small class setting. By the very end of the month Dinomite and Bulldozer had also started tennis lessons. Needless to say between learning time activities, extra curricular activities and preparing for our upcoming trip to Disney World, we were pretty busy. But that didn't stop us from having a lot of fun as well. On one particular warm day it began to downpour. 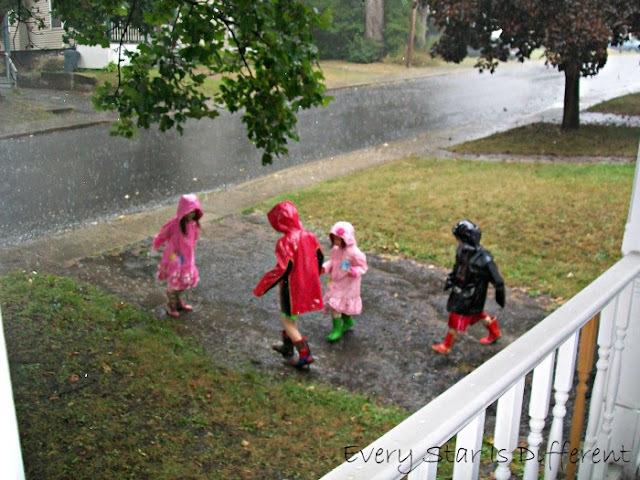 We couldn't resist putting on raincoats and rain boot and go out and enjoy the weather. We also started our 12 Months of Family Service Projects with a food drive. 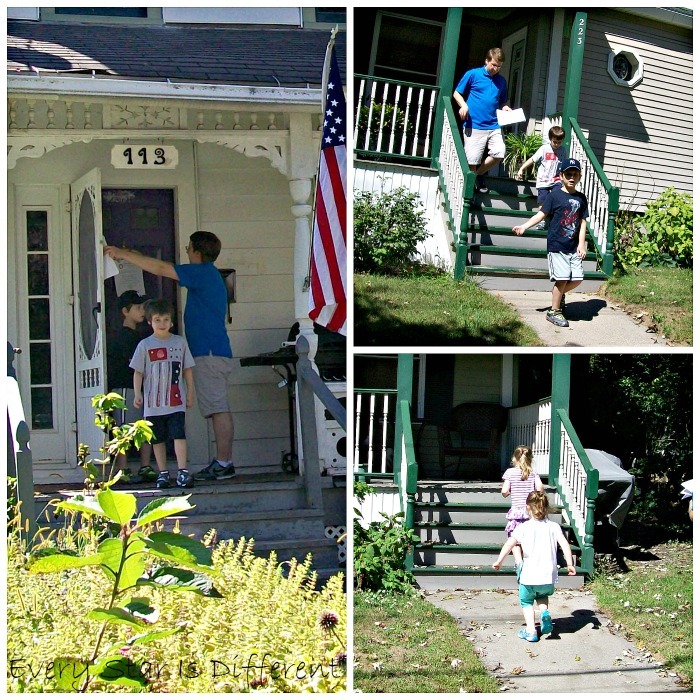 All of us delivered flyers up and down our street. None of us had a clue that there were 60+ residences on our street alone until that day. 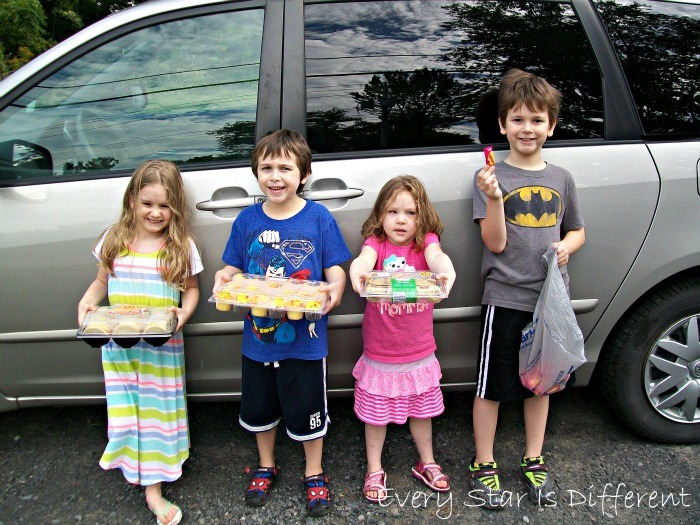 On the date mentioned in the flyer, we went around again, collecting nonperishable goods. Sadly only 6 residences participated. Still, the kiddos were excited and felt the effort well worth it. 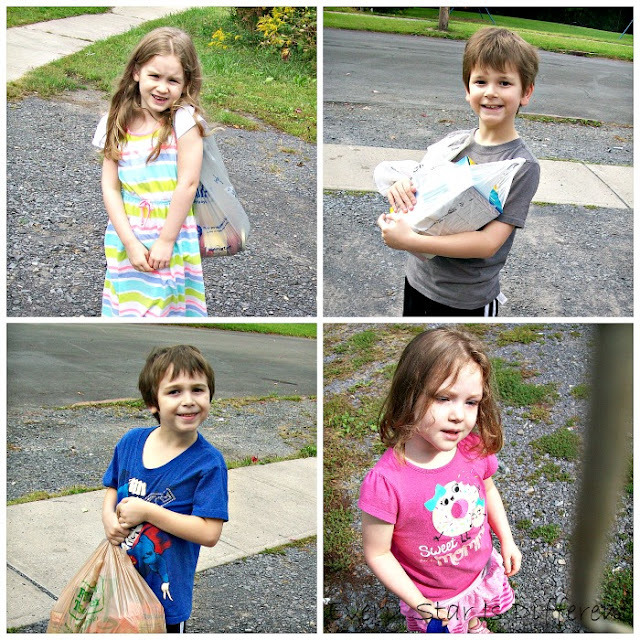 When we arrived at the food pantry we were greeted by the kindest woman. She would not let us leave until all of the children had been given treats as a thank you. Though I was not happy about this at all, the kiddos were EXTREMELY excited and couldn't wait to go home and sample everything. 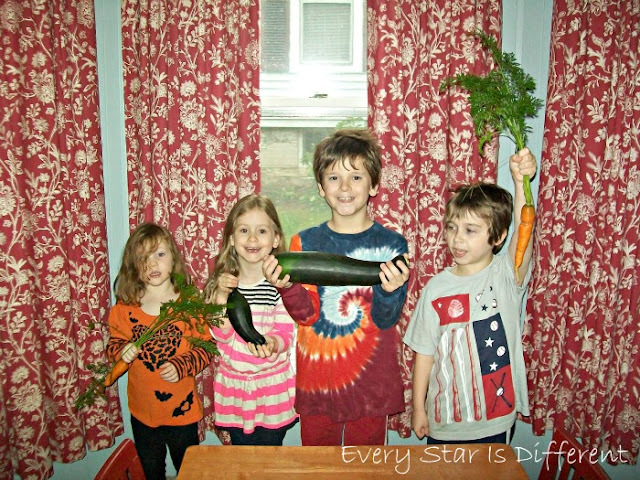 Another highlight of the month was picking fresh vegetables from our garden. They were late growing, but were still delicious! Now that we know we can be successful at gardening, we'll plant more next year. With cooler weather, we were able to make homemade pizzas once again. 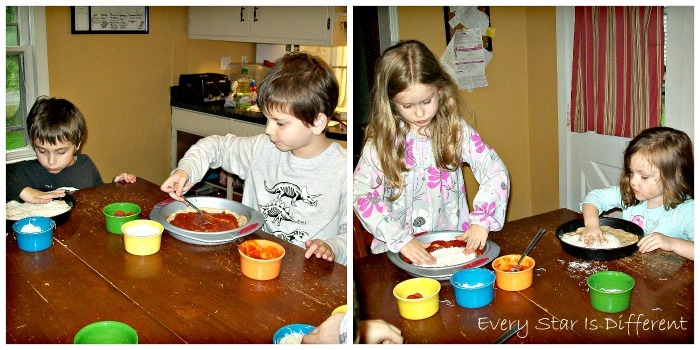 The kiddos love making their own personal pan pizzas. If only Dinomite would enjoy eating them as much as he enjoys making them. September really flew by this year. Though it went quickly, it was so nice to sink into routines. Consistency in schedules always helps the kiddos!